RETRO KIMMER'S BLOG: KIMMER'S FAVORITE ANIMATED CARTOON IS SIMON'S CAT! KIMMER'S FAVORITE ANIMATED CARTOON IS SIMON'S CAT! Simon's Cat is an animated cartoon and book series by the British animator Simon Tofield featuring a hungry house cat who uses increasingly heavy-handed tactics to get his owner to feed him. In January 2009, it was announced that Simon's Cat would be published in book format. Canongate released the title on 1 October 2009 in the United Kingdom. It was later released in many other countries and additional titles in the series were subsequently published. In June 2012, Walt Disney Animation Studios began releasing specially-made shorts of Simon's Cat, while a Simon's Cat newspaper strip ran in the Daily Mirror from 2011 to 2013. 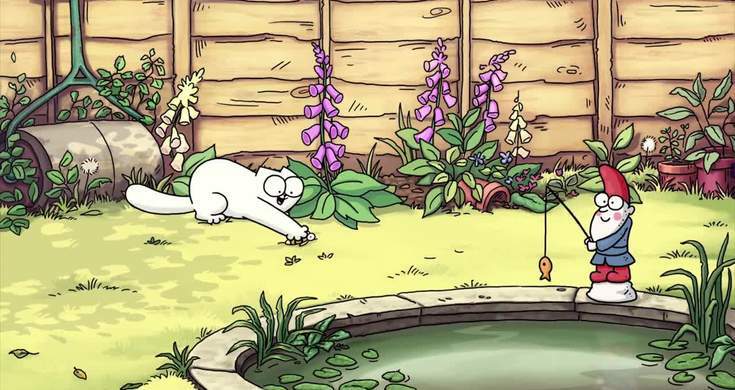 In August 2015, it was announced that Endemol UK had acquired a stake on Simon's Cat. 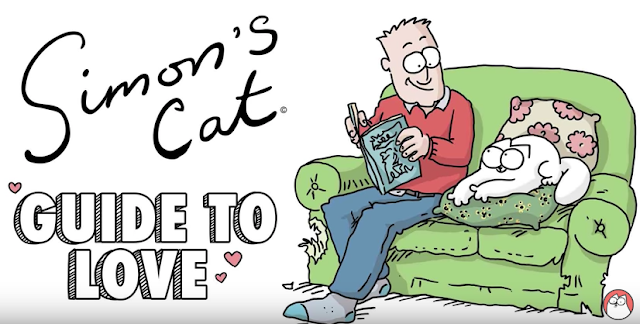 In July 2016, Simon's Cat partnered with Sesame Street as part of their Love to Learn campaign. Simon's Cat: The title character. His antics, often in the quest for food, vex his owner, Simon. He loves cat food, but also enjoys birds, mice, and fish out of Simon's koi pond. A significant amount of the humour in the book comes from his efforts to capture birds, mice, and fish. 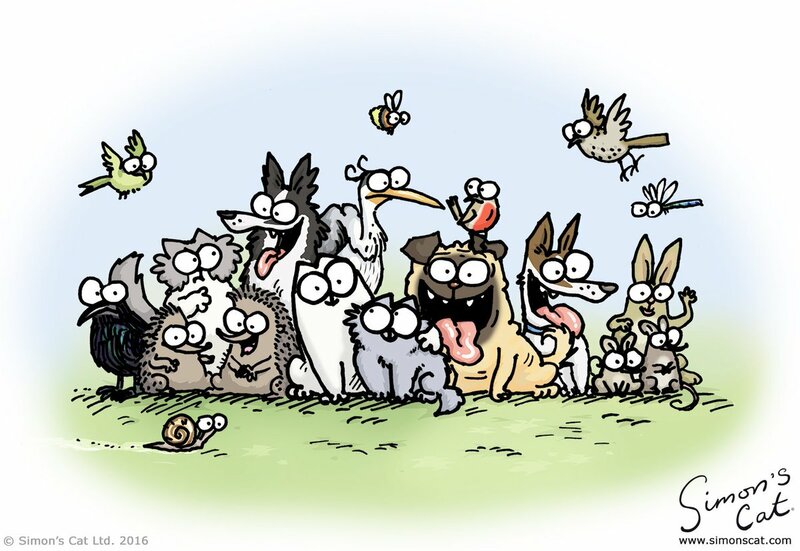 Simon's cat has not been officially named, though writer Simon Tofield says that Simon's cat is based on his own cat, Hugh and the kitten is based on Teddy. Simon: The long-suffering owner of the cat, a graphic artist. Simon's sister's dog: A dog that first appears in the video "Fed Up," in which he is fed underneath the table by a family. The dog also appears in the book and loves to play fetch. The Bird: A bird who Simon's cat chases, and who generally outsmarts him. The Hedgehog: A hedgehog that lives in Simon's back garden. Simon's cat loves to annoy the hedgehog by impaling objects such as apples, leaves, and tennis balls onto its prickles. The hedgehog also has children. The Garden Gnome: A garden gnome similar to the one broken by Simon's cat in "Let Me In." The gnome is seen holding either a fishing rod or a net. Simon's cat often tries to get the gnome to help in his schemes to catch food. The cat considers the gnome a friend, apparently unaware that it is an inanimate object. The Bunny: A rabbit that lives in Simon's garden who can literally run circles around the cat. The Kitten: In October 2011, Simon brings home a new member of the family who, in spite of his tender age, appears to be considerably smarter than his adult counterpart. The Toad: The toad also lives in the garden. The Frog: The frog appears in some shorts as well, and is differentiated from the toad in a "How to Draw...Frogs and Toads" short as well as in the "Simon Draws" section of the Kitten Chaos book. The Squirrel: The squirrel lives in a tree in Simon's back yard. He loves to pelt Simon's Cat with acorns when the cat chases him. The Mouse: Another creature that is often chased by Simon's Cat. Despite their adversarial relationship, the mouse aided Simon's Cat in an elaborate plot intended to impress a female cat in "Smitten." Chloe: A female cat who is the object of Simon's cats affections for a time. Demure and somewhat snobbish, she exhibits a finicky appetite, munching on a trail of cat treats but angrily refusing a mouse offered by Simon's Cat in the first film. Here are some cool Simon's Cat Items for sale in my Amazon Store. Click on the picture for more info.